A lot of people misunderstand the nature of their rights. The source. To the Founders, an understanding of NATURAL RIGHTS was essential. These rights pre-exist any government or document or decree. 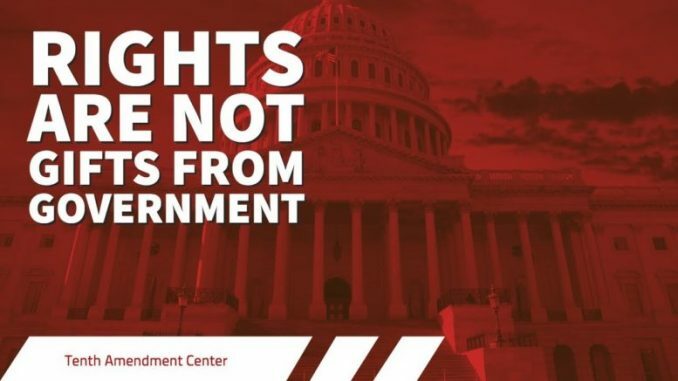 They knew that when the people view understand their rights as a birthright rather than a gift from government, they’re much more likely to ignore government attempts to restrict or end them. In other words, we the people need to learn how to exercise our rights whether the government wants us to or not. No power was given to Congress to infringe on any one of the natural rights of the people by this Constitution, and, should they attempt it without constitutional authority, the act would be a nullity, and could not be enforced. Today, unfortunately, most Americans see it the other way around. They believe that rights only exist when government gives them a permission slip. Or, when the Supreme Court says they exist…until the judges change their mind. Their view is totally wrong. That’s why we believe it’s so important to share the truth with as many people as possible. Short videos like the one below help us share this important message, with your help spreading the word, of course! Michael Boldin [send him email] is the founder of the Tenth Amendment Center, where this article first appeared. He was raised in Milwaukee, WI, and currently resides in Los Angeles, CA. Follow him on twitter – @michaelboldin and Facebook.